Part of the magic of Acadia is how accessible it is, for people of all ages and abilities. It has granite-topped mountains that a preschooler can hike. Idyllic carriage roads that can be navigated with a cane, a service animal, or a wheelchair. A wheelchair-accessible beach at the tip of a clean, glacier-carved lake. There are so many opportunities for visitors with disabilities to experience the best of Acadia, and Friends of Acadia works with the park to remove existing barriers when we can. In 1998, Friends of Acadia donated and endowed the maintenance of two wheelchair-accessible carriages to Acadia National Park for use at Wildwood Stables. 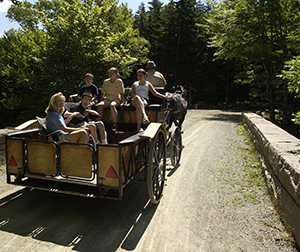 The carriages were purchased with the generous support of the Shelby Cullom Davis Foundation and provide a great way for visitors with disabilities to enjoy Acadia’s carriage roads. They carry up to two wheelchairs and four additional passengers and are available for trips Memorial Day through Columbus Day. Contact Wildwood Stables at 877-276-3622 or www.carriagesofacadia.com in advance for reservations and pricing information. 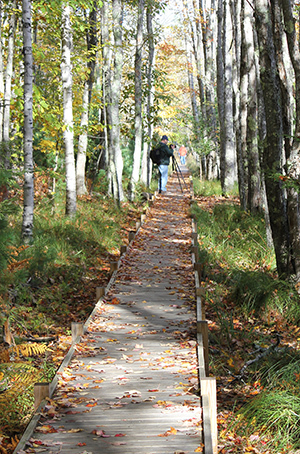 When possible, hiking trails restored through the Acadia Trails Forever partnership have been made wheelchair accessible/ADA-compliant, including a boardwalk on the Jesup Trail at Sieur de Monts, the Nature Path at Jordan Pond, and parts of the Ship Harbor Nature Trail. And Acadia’s entire 45-mile carriage road system, restored and maintained in immaculate condition by Friends of Acadia’s Carriage Roads Endowment, offers an unmatched way to experience Acadia’s peaceful interior by wheelchair. Motorized wheelchairs are allowed on the carriage roads, and their smooth surface is also appropriate for visitors with visual disabilities. All Island Explorer buses have wheelchair lifts. The Acadia National Park website has accessibility information for visitors at www.nps.gov/acad/planyourvisit/accessibility.htm.